The 1st Annual Fall Festival at Timber Lodge Ranch will be held October 11, 2014. 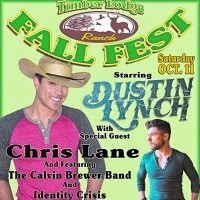 Dustin Lynch will headline the event located between Amity, AR and Bismarck, AR. In addition to the concert, the Boo-Bash 4k-6k obstacle run will begin at 11 a.m. This challenging yet fun run will include obstacles, haunted caves, a hay maze, rope swings, a hay pyramid, and thousands of pumpkins marking the course. During the race, runners will get to choose “trick” (longer routes with more obstacles) or “treat” (shorter) trails. Obstacles won’t be the only challenges participants will encounter. They could also find themselves running from zombies, Big Foot, and other menacing characters. Runners are encouraged to wear costumes, and race tickets include the concert that evening. There will also be a “Kid Zone” with activities for the kids all day long. Bigger kids can take advantage of the largest tailgate party in the area with multiple big screen TVs and food and beer vendors. “The Flying Squirrel” zip line will also be available for an extra fee. Gates will open at 10 a.m. with comedian and DJ Chucky D hosting games and giveaways. Race heats will begin at 11 a.m. with the last heat releasing at 3 p.m. The concerts begin at 2 p.m. with Identity Crisis, followed by The Calvin Brewer Band at 5 p.m. and Chris Lane at 6:30 p.m. Headliner Dustin Lynch will take the stage at 8 p.m. Festival tickets can be purchased in advance for $40, or $50 day of the event. Concert only tickets are available in advance for $20, or $25 on the day of the festival. Timber Lodge Ranch is just 11 miles from Tiffany’s Bed and Breakfast. Camping is available at the ranch, but for those who don’t want to “rough it”, we recommend staying with us in one of our luxurious rooms. You’ll get a good night’s sleep in our wonderful beds, and we’ll serve you Breakfast at Tiffany’s in the morning! This entry was posted in Events, Hot Springs Entertainment by admin. Bookmark the permalink.